Apple’s eagerly awaited ‘Back to the Mac’ event was held at the company headquarters in Cupertino and was watched live by millions of Apple fans on the official website. Apple introduced the next version of OS X and as predicted, it’s called ‘Lion’. The event shifted focus away from Apple’s mobile devices and put it on new products and services for its desktop and laptop computers. Here are the details of what the event unveiled. The next version of the OS X is the first step towards the integration of iOS and OS X as it’ll be bringing multitouch capabilities to the Mac. The new system will support swipes and gestures to perform tasks using devices like the Apple Magic Trackpad and the Magic Mouse. All the movements will be consolidated through a terminal called Mission Control. 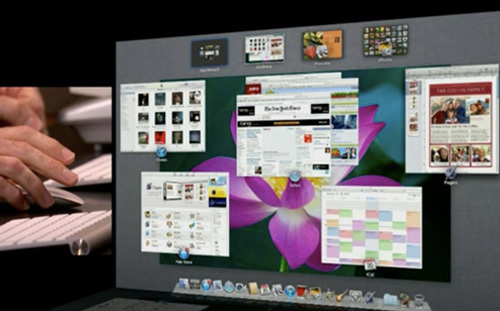 Fans expected the Mac to feature touchscreen technology but conducting the event, CEO Steve Jobs revealed that Apple has tried a number of options for desktop touchscreens but “touch needs to be horizontal”. No touchscreen Macs any time soon, we guess. OS X Lion will be available in summer of 2011. 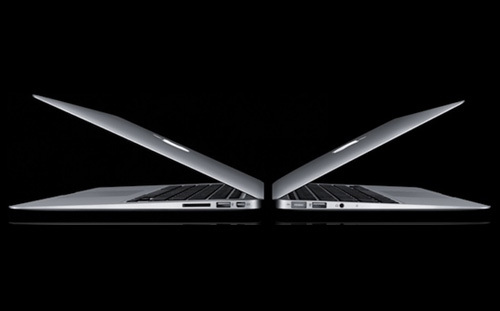 One of the most popular products launched at the Cupertino event were the new MacBook Air models. The models are 11.6 and 13.3 inches and will cost $ 999 and $ 1,299 respectively. What’s getting people super excited about the new MAcBook Air is the fact that it was declared as the logical step beyond the iPad by Steve Jobs. Now, we know the popularity of the iPad and now critics are calling the new MacBook Air an iPad with a keyboard. The new devices now have the same smooth clickable trackpads that are available on every other MacBook and MacBook Pro which support advanced multitouch functionality that the iPad is famous for. The 11.6 inch model has a display capable of a 1336 x 768 resolution and it has a battery that will last for five hours. This model comes with either a 64GB hard drive for $999 or a 128GB hard drive for $1,199. Both models feature a 1.4 GHz Intel Core 2 Duo processor, but the 128GB model is upgradeable to 1.6 GHz for another $100. The more substantial 13.2 inch model features a 1440 x 900 resolution display, with large cell phone batteries capable of running for seven hours. They come with 1.86 GHz processors and start at 128GB for $1,299, but it’s expandable to 256GB for $1,599. The 256GB 13.2-inch MacBook Air can also be upgraded to a 2.13 GHz processor. Both models are available in the market today. Apple introduced something un expected at the event when Steve Jobs announced the launch of an App Store for Mac which will be up and running in 90 days from now. Developers will get the same 70/30 payment deal for commercial apps and needless to say, this is a whole new platform for them to get busy and come up with new and Mac versions of all the popular iOS apps. Apple has seen more than 7 billion downloads in the last 2 years on the Apple App store and introducing the concept for Macs is a logical step. 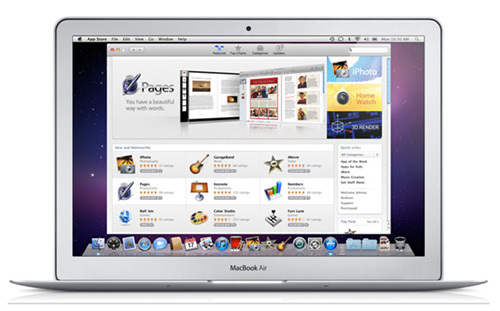 The new Mac app store will be another cash making machine for both Apple and the app developers. This feature is also one that was expected by fans and several news items had started making round prior to the event about Apple introducing FaceTime for Macs. The feature is indeed available now to download on Apple’s website but it’s in beta stage for now. 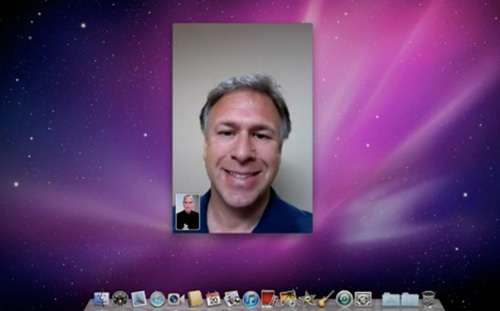 Now Mac users can make video calls not just to other Macs, but to the 4 million FaceTime-enabled iPhone 4 and iPod Touch users. Clicking on a contact instantly makes a FaceTime call and once you’re on the phone with them, a simple video window shows them in either landscape or portrait mode, depending on how they’re orienting their device. If your contact flips his or her phone into landscape mode, the image will flip on your screen immediately. Apple also introduced the next version of its iLife suite, iLife ‘11 at yesterday’s event which has brought a completely revamped iPhoto ’11. The new iPhoto ’11 now features more full-screen modes for photos, faces and places, more album themes and the ability to order more types of printed goods. 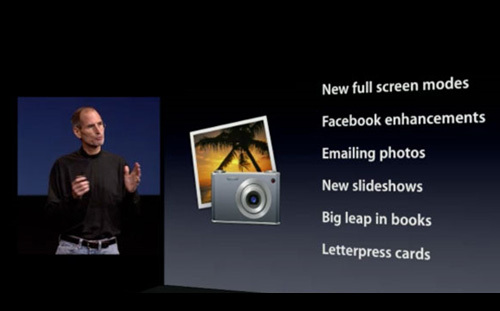 iPhoto ‘11 has also added better integration with Facebook. You can now send HTML e-mails of your photos with all of your photographs organized and designed directly from within iPhoto. There is also a new sharing info panel that shows where you have shared your photos (e-mail, Facebook, Flickr), plus any Facebook comments associated with your photographs. Apple is also now letting users create letterpress cards. These cards are made using the letterpress printing process and it’s pretty awesome that users can now take advantage of this sort of printing technology and templates from within a consumer photo program. The new iPhoto ’11 also has the option to show your photos to friends and family in a slide show and keep them organised in the new and upgraded albums feature. The new iLife suite will be available for free to all new Macs and for $ 49 for existing Mac users. Next post: FarmVille For iPad Released, It’s Free!